Alongside the exhibition, Thailand LAB INTERNATIONAL 2018 will also be a knowledgeable platform for laboratory experts. 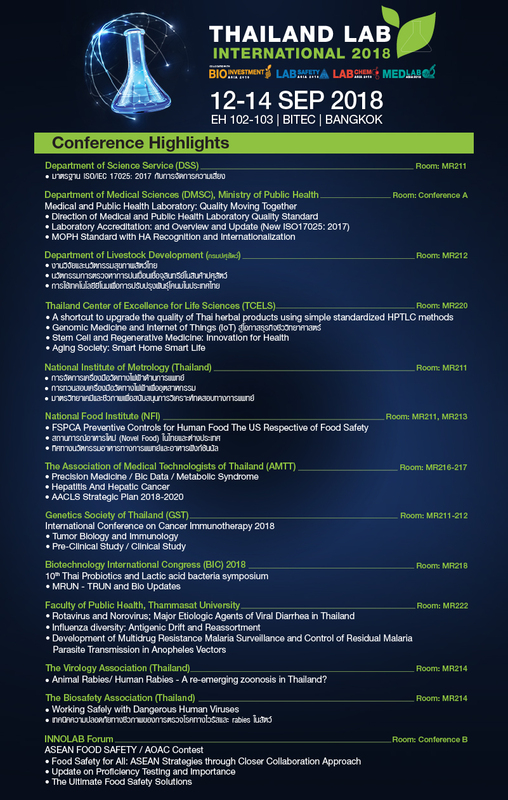 With various conferences, workshop and seminars from many organizations, government agencies, associations, academic institutes, content will cover all the important and leading industries.Visitors and delegates will gain massive flow of information both in Thai and English and experience knowledge exchange among industry experts. Business Matching & Hosted Buyer Program will be one of our key features to promote business networking, enhance onsite trade value and investment opportunities to all stakeholders. Potential local and foreign buyers, researchers, scientists, technicians, laboratory professionals will be invited to meet with leading exhibitors. Interested buyers can register and enjoy buyer benefits at www.thailandlab.com. See you at “Thailand LAB INTERNATIONAL 2018”during 12-14 September 2018 at EH102-103, BITEC, Bangkok, Thailand.